Cosmetic acupuncture is the perfect natural holistic treatment to improve your looks, help you relax, sleep better and improve your health. The treatment focuses on skin concerns such as hyper pigmentation, scars and premature ageing. Facial and body acupuncture improves skin moisture balance, cellular turnover and reduces inflammatory conditions such as eczema, psoriasis, dermatitis. For bestl results this treatment is layered with personalised organic skin care, life style and nutritional advice. The micro needle puncture stimulates a healing response by the body encouraging the production of collagen and elastin. Circulation improves which enhances skin tone and texture. Your skin function will re-balance, protect and hydrate your complexion – naturally. Using ultra-fine body or ear needles will enhance organ and body function and assist in facial tissue renewal. As acupuncture drastically increases skin absorption it is important to use the highest nutrient-rich skin care and make up to support healing and rejuvenation. In 2016 Nat van Zee meets Amanda Shayle, Vice Chair of the Acupuncture Society and CEO of Acuregen Cosmetic Facial Acupuncture. 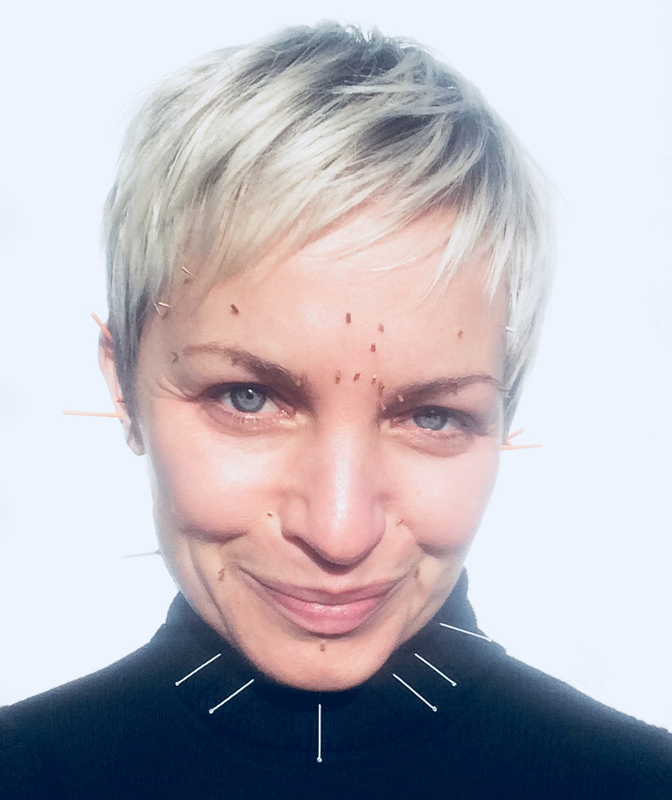 Fascinated by natural holistic beauty modalities Nat receives several Acuregen Signature Treatments, including ear and body puncture layered with LED light therapy and growth factor facial mask, see here. Impressed with the wellbeing and beauty benefits Nat trained at the Acuregen Academy and is now a qualified Acuregen Cosmetic Facial Acupuncturist. Above you can see Acuregen's 'Thrive' needles, short intradermal needles 3 - 6 mm, which are inserted into the face, combined with longer needles in the neck, ears and body. As a writer specialising in health and wellbeing I can recommend Nat’s services as some of the most effective and enjoyable I have experienced. After a facial acupuncture treatment with her, I left feeling rejuvenated and energised – as if I had been given all the physical effects of a massage and health benefits of acupuncture with the visible results of a facial. This is a holistic treatment in the truest sense, with Nat realigning body and soul. I love acupuncture for its powerful precision in getting to the root of everything from low mood to poor kidney function; needling may well be the next big thing in beauty and wellbeing. Nat’s professionalism and passion is palpable and it is clear that she has a magic touch. The care she showed me from the moment of booking through to the explanations pre-treatment and post follow-up was impressive. Anyone who has reservations about needles will be reassured by Nat’s knowledge and sensitive awareness, which means little more than a pin prick is felt. I had needles in my face, my ears (to treat my whole body but especially my liver and spleen) and my feet for grounding. Most acupuncturists leave you once the needles are in but Nat gave me a part massage that was also a healing. I left feeling lighter, aligned and younger after what is effectively three treatments in one. An Acuregen facial acupuncture treatment is much more than a beauty therapy. General health and internal organs are stimulated to maximise the healing response to the treatment. This is supported with ear and body acupuncture, organic skincare, combined with LED Light therapy* plus diet and lifestyle recommendations. Together this results in longer lasting improved looks, wellbeing and health. During a treatment Acuregen's micro Thrive needles are inserted into the skin of the face, combined with longer needles in the neck, ears and body. The Thrive needles enable layering of treatment with organic skincare masks and light therapy. This rejuvenating natural treatment improves overall elasticity and complexion, ofter referred to as a 'natural face lift'. The consultation starts with a tongue diagnosis and full medical consultation to understand your concerns and desired outcome. Followed by a relaxing and cleansing facial massage which will help you to unwind. Gentle acupuncture techniques and ultra fine needles will relax facial tissue, define, sculpture and encourage renewed circulation. The treatment includes a personalised skincare mask to encourage collagen growth, reduce skin redness, pigmentation and deeply hydrating benefits to reduce fluid retention and tone facial contour. Our focus extends beyond beauty and is uniquely designed for your wellbeing. With your permission we may integrate elements of body pressure or massage for you to deeply unwind. To complement the holistic treatmeant we will advise you on the best organic, natural and vegan beauty products to benefit skin healing and rejuvenation. If medical facial micro-needling is a part of the treatment plan, it will usually be done on your 4th session and then every 4 weeks – supported with sessions of cosmetic acupuncture in between to maximise results. We believe in slow, natural nurture for long-lasting beauty. You will be familiar with the needling experience and you will be supported with the best organic skincare and nutritional advice. Acuregen's gentle needling approach will relax and support the immune system on a journey of cellular replenishment from the inside out. Treatments last up to 90 minutes. Prices at request. All treatments are insured by Balens Group Insurance. "I have experienced acupuncture many times before and I am an advocate of it, never had it specifically for my face and skin. Nat made me feel at absolute ease, I felt deeply relaxed and it did not hurt at all. Immediately after the treatment my skin looked plump and radiant. Nearly a week on my skin looks fuller and feels so soft. I will most certainly be having more treatments. I can not recommend facial acupuncture with Nat enough, it is great for both mind and body."